Jules (Drayton, United Kingdom) on 21 November 2012 in People & Portrait and Portfolio. Congratulations to you Jules for this lovely achievement. I love this sweet little girl. She is a pretty doll. Very beautiful portrait! Quels beaux yeux bleus quels charmant enfants, mangigique compo. A "festival" of extraordinary blue eyes !! I can imagine her later :-)) She is very attractive. Des yeux superbes,très joli portrait de cette jolie petite fille. Well done and wow what stunning blue eyes !! Splendides portraits avec un traitement des couleurs superbe. Félicitations pour ta 500eme!!! Bonne journée. You are celebrating with the right company :), they are cute. Wonderful capture of her blue eyes - and congrats on your 500th posting milestone! BEautiful kids, beautiful portrait ! Congrats on that!! What lovely blue eyes they've got! Fantastic image! Congratulations for the 500th. An excellent portrait, she is adorable this little girl. A beautiful photo. Grear shot. Congratulations! AN adorable portrait - their eyes are captivating. Wow - those eyes are amazing. You are going to have to watch out for the boys in a few years, they will be pounding at your door. Congratulations! It has been a wonderful 500! They are so adorable. I just love those blue eyes! Congratulations Jules ... twice !!! First for your great achievement on AM3 and second for your adorable kids, a much greater and valuable achievement from you and your wife ... Well done !!! 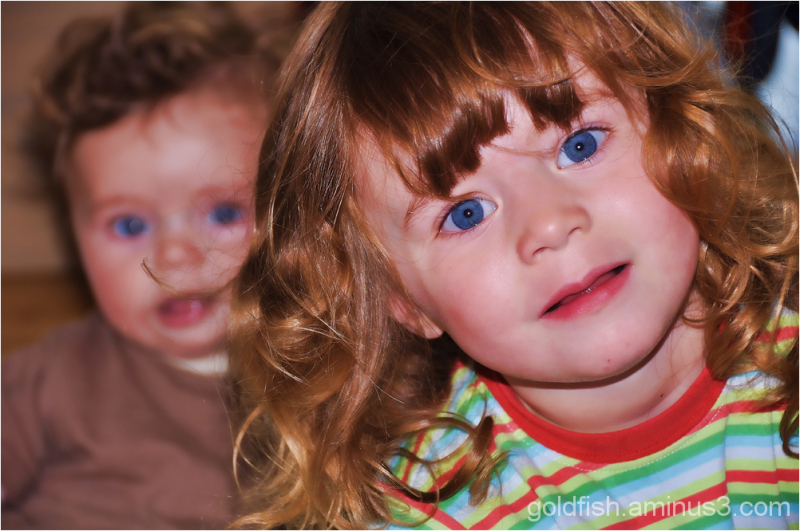 Beautiful blue eyes shining alive and the red hair behind...Lovely!! !